We’re Inclusive - are you? AISLi schools are known for our quality language teaching but also for our belief that all learners can be successful and that everyone in our learning organisation is still learning. Over the past few years we have been focusing more and more on inclusion, which has meant supporting and empowering students with disabilities and learning differences as well as championing the rights of non-native English speaking teachers. One of the many projects taking place across Italy over the past year has seen one of our members partnered with an organisation called For Action, based in Bassano del Grappa (VI). Through training and empowerment, it aimed to encourage disabled people into employment. The remit was not only to prepare the participants for Cambridge Exams but to get them ready to face the challenge of work experience abroad. The member school saw its role as giving students tools to communicate in English and the confidence to go into this new, and perhaps intimidating, environment. The big emotional pay off came when one of the participants organised an event for disabled people. Paraplegic as a result of a car accident, her enthusiasm for learning and making connections with those around her was a real inspiration. During this event two of the shyest course participants, one with a speech difficulty, performed a song in English, which moved many of the audience. At the end of the project all three groups will be awarded their Cambridge certificates ranging from Key to Advanced, a fitting finish to this part of our journey towards inclusivity and employment. 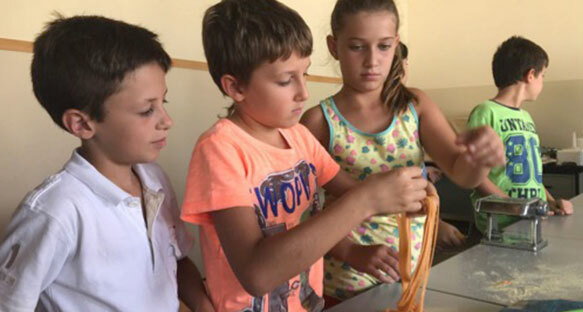 For teachers involved in projects like this across Italy it is a stimulating experience which they approach with enthusiasm and sensitivity, aware of the various difficulties faced by the students in terms of learning, mobility and self-esteem. Teachers and tutors said that their time spent with these groups made them reflect on how they treat all of their students and colleagues, a renewed awareness that everyone deserves special consideration as we are all fighting our own battles, whether seen or unseen. Chiara, one of the students, sums it up well by saying, “Communication isn’t easy for anyone, least of all for me. The work I did in Malta gave me the possibility to learn how to listen – listen to myself and others. I shared laughter, joy and pain. This helped make me a person who is stronger, more aware, more independent. I’m very grateful to For Action for giving me a second chance.” . The ethical code that AISLi schools work to is incorporated into their mission statements and the AISLi code of ethics and shared with students and parents of younger learners. Adhering to this code has brought the schools closer together and has seen a number of projects under the banner “AISLi Cares”. This includes a summer camp coordinated nationally and offered, free of charge to the children of Farindola, who had had to deal with appalling earthquakes at the beginning of the year. The aim was to offer quality learning and lots of fun to these children and a chance to focus on the lighter side of life. AISLi schools are influencers in the industry. All of these experiences have led our members to promote inclusive teaching in inclusive schools by holding an conferences and working with the local communities on worthwhile projects. The next conference, inspired by the values we’re working with, is the All In: Include and Educate 2017 and is the first in a series bringing together educators from diverse backgrounds to promote a continuous dialogue on inclusion. This year the event will take place on the stunning Venetian island of San Servolo. For the many other special projects, please visit the websites of the individual member schools.